Will Mourinho’s Midas touch transform Manchester United? The fans reaction at the sight of a crazy little Portuguese fella running down the touchline at Old Trafford after seemingly losing his mind was one of pure disbelief at the audacity of the man. That man will get a totally different reaction from the United faithful when he walks along the side of the pitch to take his seat in the dugout at the Theatre of Dreams as the new Manchester United manager come August. Jose Mario Dos Santos Mourinho Felix or more commonly know as The Special One, a moniker he bestowed on himself, brought his Porto side to Old Trafford back in 2004 and knocked United out of the Champions League on his way to lifting the famous trophy and cementing his place as one of the most sought-after young managers in football. Fast forward twelve years and the 53-year-old is the man that United have pinned their hopes on to revive the fortunes of the great club after three seasons of underachievement in the hands of Moyes and van Gaal. The one-time interpreter turned coach certainly will not lack in the self-belief that one needs to succeed at United and can fall back on his experiences at clubs such as Porto, Chelsea, Inter Milan, Real Madrid and Chelsea again. At each of those clubs, he led them to either domestic or European titles or even both. He also managed to get the backs up of the club owners with his outspoken views. Mourinho crossed swords with United and Alex Ferguson in his first spell at Chelsea during his three years there and backed by Roman Abramovich’s billions he built a title winning side that became a thorn in Fergie’s side on more than one occasion. He transformed Chelsea from an average side to Premier League champions for the first time in fifty years. During his first two seasons, he won the league twice, plus the FA Cup for good measure. The Champions League evaded him and this led to disagreements with the owner. Following his fall out with Abramovich, Mourinho moved to mainland Europe in 2008. He continued his golden touch at Inter Milan guiding the Italian giants to two championships and the Champions League. Then the lure of a move to Real Madrid proved too strong and he found himself pitting his wits in Spain against Pep Guardiola the coach at Barcelona. Even though he guided them to the La Liga in 2012 he missed out on the Champions League the following season and departed by mutual consent. He surprised everyone by rebuilding his relationship with Chelsea supremo Abramovich and returned to West London for a second spell at the Bridge in June 2013. In his first season back, he only managed to guide them to third in the table, but the following campaign, they completed the double of the Premier League title and League cup. 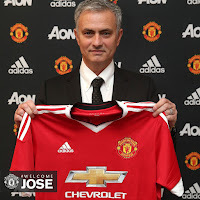 In August 2015, following the success of the previous season, Mourinho signed a five-year contract. However, come December, all was not well at the Bridge after losing nine out of sixteen games the pressure was on. There were clear signs coming from the club that they had problems. The players’ body language and the fall out with the club doctor played out in the press and eventually club and manager parted company yet again. Since the start of his enforced sabbatical, his name has been linked with the position at United on a daily basis and the worst kept secret in football was finally confirmed on May 27 following the dismissal of Louis van Gaal. There is no doubting his winning mentality and it seems perfectly in tune with United’s desire to return to the days of success enjoyed under Fergie. And his old friend and foe won’t be too far away as Pep will be close at hand at the Etihad to ensure that their fight to be the dominant force will continue at a pace. With the United faithful wholeheartedly behind him, Mourinho has already jumped over the first hurdle that Moyes and van Gaal managed to trip over through their inept tactics and philosophies, the fans’ support. Many have voiced their concerns that his ego might be too big for the hot seat at Old Trafford but consider United’s past managers. They were not exactly shrinking violets Busby, Docherty, Atkinson and Ferguson were never ones to hide behind closed doors when something had to be said so expect some delightfully interesting press conferences. Personally, I am looking forward to seeing how Mourinho sets out his stall in the transfer market. Who he brings in and more importantly, who he releases as he attempts to make his mark on the club from the start. Mourinho’s preference for playing with three central defenders and a strong midfield may not sit well with the present set of players who struggled with a similar system under van Gaal. He needs to build his own team, which may take more than one season to fulfil. Many existing United players will be worrying whether or not they fit in with his plans or will be surplus to requirements. Mata springs to mind as he was allowed to join United while Mourinho was in charge at Chelsea. He has already made the statement that the past three years has not been good enough for the club. However, he will need to rejuvenate a side bereft of that all important winning mentality added with a mixture of new blood that will also show his intent in the transfer market with a reported £200 million at his immediate disposal. Bringing in new players without the promise of Champions League football is never easy, but his name and stature in the game should be enough to lure marquee signings to Old Trafford. Zlatan would be a good start. United will surely go into the 2016/17 campaign on a more positive note than if van Gaal had remained. And you can expect the special one to produce a special season that will have all the United fans forgiving him for his over the top dance down the touchline all those years ago. In fact, they would love to see it again if it was in celebration of winning the league. One thing is for sure and that is there will be no shortage of entertainment during his reign as manager. 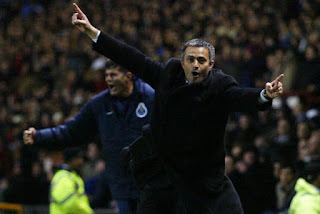 Tags: chelsea, Inter Milan, Jose Mourinho, man utd, Old Trafford, Porto, premier league, Real Madrid, Special One.